Ready for a career in computer programming but not sure where to begin? New, revised 2018 Edition! Learn three of the most important programming languages: Java, SQL, and C++. With Programming: Computer Programming for Beginners Learn the Basics of Java, SQL & C++ - Revised 2018 Edition, by Joseph Conner, you'll learn the coding skills you need to build a broad range of apps for PCs and mobile devices. This revised 2018 Edition, is fully updated with all the current information. It's not just a great place for beginners to get started, it's also a handy reference and useful tool for experienced programmers who haven't used Java, SQL, or C++ for a few years. 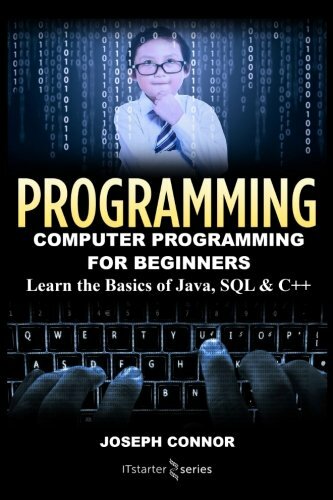 Programming: Computer Programming for Beginners Learn the Basics of Java, SQL & C++ - Revised 2018 Edition, by Joseph Conner is a quick guide designed to get you up and running fast. You'll start by learning all the basics, so you have a solid foundation for more advanced skills. Before you've finished your journey, you'll start seeing results right on your screen with helpful exercises, and after you're done, you'll have a useful reference to go to when you need it. Launch your computer programming career today with Programming: Computer Programming for Beginners Learn the Basics of Java, SQL & C++ Revised 2018 Edition, by Joseph Conner.